The pain surges through her with hurricane force, an all-encompassing storm of sustained energy battering on seemingly immovable political pillars. The Drilling Company, Broome and Ludlow Municipal Parking Lot, New York, N.Y. The persona of King Richard III, as presented by the Tudor chroniclers, has so much to give for a writer of William Shakespeare's imagination, insight, and skills. Taken with its three-part prequels, the Henry VI plays, we can even see the early-career Shakespeare honing his character-building abilities with Richard, weaving in biographical and psychological elements from the first three plays to create a figure that is either multidimensional or multiduplicitous—or both, in fact. 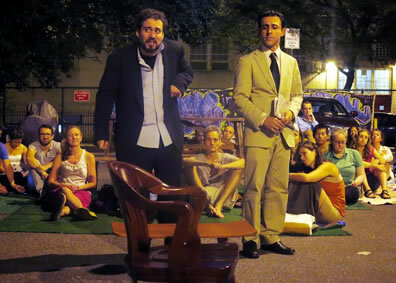 Richard (Alessandro Colla, left) and Buckingham (Arash Mokhtar) in The Drilling Company's Shakespeare in the Parking Lot production of Richard III. Photo by Jonathan Slaff, The Drilling Company. And the historical figure of Richard keeps on giving. In the past year, in a Leicester city car park, a skeleton was unearthed and confirmed by the combination of DNA evidence and historical record to be Richard's. For the Drilling Company Theatre in New York City, this news was golden. 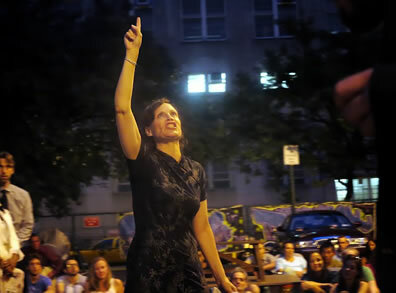 The company has for eight summers staged Shakespeare in the Parking Lot (taking over a tradition begun in 1993), and Richard himself presented the perfect title to conclude this summer season. What could have been a gimmick is anything but. This Richard, as played by Alessandro Colla, is of Shakespearean dimensions, and the clear-eyed production is presented with precision under the direction of the company's founder, Producing Artistic Director Hamilton Clancy. The parking lot is merely a communal space, much as plazas, parks, and lawns are for other theater companies. The playing area, audience seating, and a tent dressing room take up some 15 spaces in a 67-space lot; the other spaces are still serving their original purposes for 50 cents per 15 minutes (four-hour limit) even during the show. Traffic passes on the street, helicopters pass overhead, and local residents pass by on their way to New York City nightlife—some pausing to check out the blank verse commotion, a few staying in rapt attention. No special effects; lighting is provided by New York City Department of Transportation streetlamps. The audience members specifically there to watch a play—and that numbered almost 150 a half hour before showtime—brought picnics, pizza, or carry-out from neighboring delis and fast-food restaurants. The few dozen seats were dibbed as early as 90 minutes before, and most people sprawled on mats and blankets on the blacktop. Presented in modern dress, this Richard III is text-centric; its only conceptual leaning is to emphasize the women's plight in the play. Clancy retains almost entirely all of the scenes featuring Queen Elizabeth, Lady Anne, Queen Margaret, and the Duchess of York, including the rarely kept Act II, Scene 2, featuring the Duchess (Kristin Johansen) and Clarence's two young children (to keep the nonintermission presentation at two hours, Clarence's dream is sacrificed and the final act is significantly compressed). Lord Stanley becomes Lady Stanley (Valerie Redd), portraying yet another mother and her cares. Catesby (Jenna Bosco) and Ratcliff (Ayo Oneke Cummings) also are women, and Cummings plays the Second Murderer as a heroin addict in need of a fix. Clancy also gives Margaret her due—more than her due, really, for every time one of the characters meets the end promised by Margaret's curses, the dethroned, widowed queen stands to the side of the stage accepting the acknowledging glances of Richard's latest victim. Normally, I consider this device too overobvious; but in this production these moments represent a passing peace for the characters, one leaving the coil of Richard's world, the other seeing another segment of Richard's world uncoil. Another benefit of Margaret's extratextual presence is that, though she remains quiet, we get more Sheri Graubert. Her Margaret aches at the memory of watching her son killed and losing both her husband and her crown (plus an illicit lover) in the previous two plays of the tetralogy. However, she is not so much consumed by the pain as she is intent on harboring it—taking her own advice that she later offers Queen Elizabeth on how to curse effectively ("Compare dead happiness with living woe: Think that thy babes were sweeter than they were, and he that slew them fouler than he is"). The pain surges through her with hurricane force, an all-encompassing storm of sustained energy battering on seemingly immovable political pillars. Yet, Graubert portrays Margaret in the prime of life, a woman who could still wield a sword in battle if given the opportunity, and she circles her foes (even when there are six of them on stage at the time) like a tiger considering when to pounce, growling curses that ultimately prove more meaningful than any army she's ever led. Small details define Graubert's performance. Richard unsheathes his dagger when he reminds her that she had been banished on pain of death, and she thrusts herself at him as she replies, "I was, but I do find more pain in banishment than death can yield me here by my abode," challenging him to put her out of her misery which she knows to be an effective parry of any stab Richard could attempt. In the scene of the three queens, Graubert's Margaret checks off the York family's victims like a to-do list; only Richard remains alive. She points accusingly at the Duchess's belly when she laments that "From forth the kennel of thy womb hath crept a hell-hound that doth hunt us all to death." She later bequeaths her cares to Elizabeth—"Now thy proud neck bears half my burdened yoke, from which even here I slip my wearied head and leave the burden of it all on thee"—and Graubert gestures the removal and release of the yoke as her body notably relaxes. Graubert exits both her big scenes to audience applause, and Margaret's spirit is probably still occupying two or three parking spaces, defiant of any four-hour limit. And yet, Colla still holds his own as Richard. Left arm curled, he maintains a perpetual smile, but one that slides easily from seemingly sincere to sneer. He clearly identifies himself at a key point in his opening "Now is the winter of our discontent" soliloquy. "Since I cannot prove a lover, to entertain these fair well-spoken days, I am determined to prove a villain and hate the idle pleasure of these days," he says, pauses, and then laughs with just a hint of maniac echoing out across the city neighborhood. "Plots have I laid, inductions dangerous." The laugh and shift in tone signals a malevolent Richard, rather enjoying the villain's role—no deep psychological reading here. Yet, Colla never goes over the top with his villainy but, like his cramped hand, keeps it close to his vest. He's not so much hurt by his mother's lack of love as he is dismissive of her. He's the favorite uncle to Clarence's kids, who run to him knowing which pocket to pick for Tootsie Pops even at the very moment he is having their father—his brother—murdered (his older, Elizabeth-influenced nephews treat him disdainfully). When Lady Anne (Leila Okafor), during their courtship scene, spits at him, Colla's Richard sounds like a hurt boy: "Why doest thou spit at me?" But he goes from there to a testament of real pain, recounting how his brother Rutland and his father were killed (the latter story, he points out, told to him by Anne's father). This moment Colla acts so effectively he not only moves Lady Anne but the audience to some pity. But Anne is right to suspect him of dissembling even here. When she leaves, Richard immediately assumes a disarmingly business-like tone as he issues orders to the servants, and then turns to the audience. "Was ever woman in this humor wooed? Was ever woman in this humor won?" he says in a voice that embodies obvious pride in his acting abilities. This Richard offers up another Tony-worthy performance for the London mayor and citizens as they, led by Buckingham (a slick New York politician in the performance of Arash Mokhtar), "convince" Richard to take the throne while he meditates with a "holy book" (a Folger Edition of the Richard III text). However, late in the play, when he woos Elizabeth (Veronica Cruz) for her daughter's hand in marriage, Colla's Richard has lost the keenness in his acting skills; his performance here is one-note, his professed smile never sliding out of the sneer range, but I sense this was Colla's intent rather than any weakening in the actor's constitution at this stage of the performance. Queen Margaret (Sheri Graubert), demonstrates her impressive cursing skills in the parking lot-staged Richard III. Photo by Jonathan Slaff, The Drilling Company. Colla's Richard is timeless, but other characters play effectively as modern types. Clancy presents Hastings as a Southern political boss, inherent in his arrogance and ignorant of the shifting political landscape. Rachel Weekley turns Prince Edward into a leather-jacketed, sunglass-wearing, teen pop star, spoiled by fame and privilege, throwing hissy fits and making demands on everybody, including Richard. Vince Reese plays the Duke of York as the ironic, geeky teen, hovering over his iPad when he's not issuing insulting asides to his elders (Colla's Richard lets slip a "Yuke of Dork" referring to the boy). Reese also plays the First Murderer as a slacker dude, and his teaming with Cummings turns the lead-up to Clarence's murder into a comic sketch as first one then the other wrestles with his or her conscience. Clancy carries out an interesting visual motif with newspapers: Buckingham, Stanley, and other characters often appear reading a New York Times or carrying a paper. "What news abroad?" Richard asks of Hastings in the first scene, signalling a court keen on keeping informed (a necessary survival skill with Richard around). Shakespeare turned introspective with his Richard in the latter third of the play, wrapping up the character's three-play psychological arc before his death: he does call this history the tragedy of Richard. But without that arc, the later scenes of Richard III can drag a production into doldrums. After Buckingham's death, this production sprints to its end, interspersing the speeches of Richmond (Shane Mitchell) with those of Richard, dispensing with the ghosts' visit and, instead, having four of Richard's victims (Hastings, Buckingham, Anne, and York) stand in a circle in the middle of the stage staring dispassionately as Richard speaks his final soliloquy. In the final battle, Richard comes on saying his famous lines, "A horse, a horse, my kingdom for a horse," and then duels with Richmond using red umbrellas. Umbrellas in place of swords is somewhat strange, but Vince Reese's choreography of the fight is something spectacular, and when Richmond finally overcomes Richard he uses the latter's dagger to pierce his heart. Repeating, "A horse, a horse, my kingdom for a horse," Colla's Richard III dies. Fittingly, in a parking lot.